The Transcultural Dialogue project presented and discussed in this article can be used, and adapted accordingly, as an effective approach to learn about self and others. By facilitating transcultural dialogue, teachers can guide students of all ages in diverse locations in powerful collaborative meaning-making through group artworks that deconstruct and reconstruct visual culture. The Transcultural Dialogue contemporary approach to global group work embraces and supports peer-to-peer learning and generative knowledge construction. We discuss challenges, possibilities, and opportunities of collaborating online between two higher education institutions: Makerere University in Kampala, Uganda, and Penn State at University Park, Pennsylvania, USA. Transcultural Dialogue is an action research project, begun in 2007 by Karen Keifer-Boyd, with colleagues at Makerere University in Kampala, Uganda, and University of Helsinki. The Transcultural Dialogue concerns contemporary visual culture in U.S., Ugandan, and Finnish contexts in a project designed to erode assumptions, ignorance, and misunderstandings about each other’s lives, beliefs, and values through reciprocal reflections, in the form of a conversation, as a mashup of perspectives. Mashup is a term most often associated with a musical genre of new work composed of selected elements of other songs, seamlessly blending diverse lyrics, vocals, riffs, and instrumental soundtracks. Typically, the purpose is to critique music culture. The Transcultural Dialogue project is a techno-cultural mashup–that is, a hybrid mixed reality of virtual and physical, participatory pedagogy and online architecture for learning about self and others. We adapt the term “mashup” to describe the Transcultural Dialogue process of critiquing visual culture through participatory pedagogy. Visual culture is an economical and powerful medium for creating artwork, as it involves using images that are easily accessible, surround us daily, and subconsciously impact our worldviews and beliefs. In collaborative visual culture artworks, meaning is made through the collective art-making process and interpretations of the finished work. Multiple voices have the potential to create rich artworks that lead to deep interpretations. Group effort can generate unanticipated new knowledge and unique learning experiences that vary based on participant grouping. The Transcultural Dialogue project was created in order to find ways to breakdown cultural stereotypes and misunderstandings between people from different cultural backgrounds. We achieved our goals through the use of social media to facilitate learner conversation and collaborative art-making (see Figure 1). This is based on three theoretical arguments. First, visual culture is a powerful space to explore social justice issues and one of the means to teach through visual culture is through creative mashup art-making (Darts 2004; Freedman 2000; Garoian 2006; Knight, Keifer-Boyd, and Amburgy 2004). Second, collaborative constructivist learning (such as creative mashup art-making) creates a community of learners who work together to transform their learning experience (Hung et al. 2005, Mintrop 2004, Whitcomb 2004). Third, after establishing a reflexive understanding of the learning process in a local setting, social media is an effective means to promote dialogues among people across different cultures and geographic locations (Ertmer et al. 2011; Higgins, Wolf, and Torres 2013; Leppisaari and Lee 2012; Rautenbach and Black-Hughes 2012; Sun and Puterbaugh 2013). From researching Transcultural Dialogue participants’ reflections and experiences, we argue that our approach of using social media to create a community of learners and facilitate learner collaboration of visual culture mashup art-making to disrupt misconceptions about different cultures is effective and meaningful for use in art courses from sixth grade to higher education to help students learn about self and others in relation to societal expectations and embodied place-based experiences. 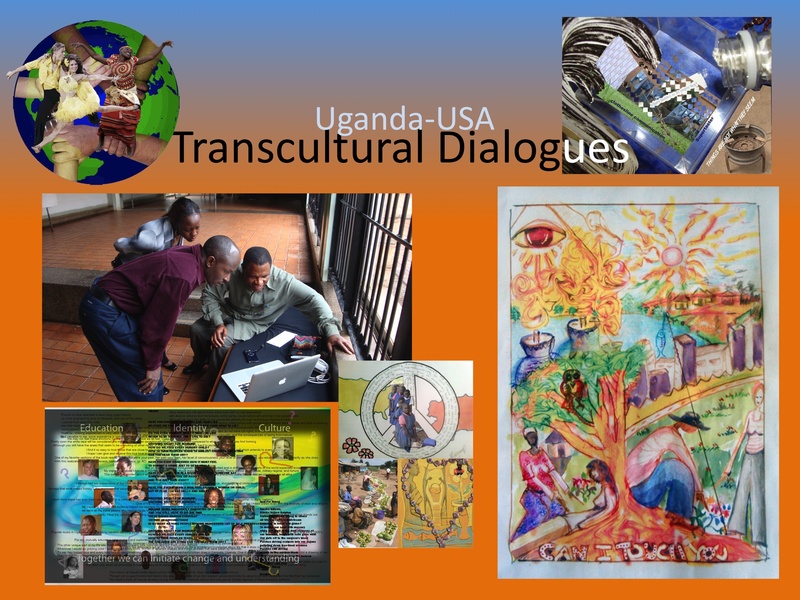 Presented here is the third iteration of our Transcultural Dialogue project, in 2010, which involved students at Makerere University in Kampala, Uganda in dialogue with students at Penn State, University Park, Pennsylvania, USA. The authors share their experiences of teaching and learning using social media to collaborate in creating art from dialogue between two groups of art students who are culturally and geographically distant from each other. Ladson-Billings (1995, 2012) introduced culturally relevant pedagogy as a theoretical model to understand student achievement in developing critical perspectives that challenge inequities. The pedagogical approach, also referred to as culturally responsive teaching (Gay, 2000), incorporates and explores, through a dialogic and collaborative learning project, the culturally situated knowledges and standpoints of students and facilitators. The Transcultural Dialogue project, based in culturally relevant pedagogical theory, provides collaboration opportunity for project participants to make visible to self and others their cultural beliefs, practices, and values. The project began with participants bookmarking websites that they perceived represented the visual culture of Uganda and the United States. We used a free Web 2.0 tool, Diigo, that could be used with low bandwidth, an issue for the Ugandan participants. The original plan was to use Dabbleboard, an online whiteboard, to create artworks collaboratively between Ugandan participants and U.S. participants. However, Dabbleboard would not work on the weak Internet connection in Uganda. Diigo is a social bookmarking tool that has a plug-in for web browsers. Participants used the plug-in with their browsers to bookmark websites. A Diigo group was set up on the Diigo website as a virtual space for the interactions between participates. The U.S. and Ugandan participants were asked to bookmark websites they think related to the culture or visual culture presentation of the other country and add their comments on these sites. All the bookmarked sites and commentary fed into the project’s group in Diigo set-up by Keifer-Boyd, the facilitator who designed the online pedagogical architecture, and participated in all stages of the project and artmaking while in Uganda. Each of the participants in the project commented on why they selected the particular representations to bookmark. Participants next explored what was bookmarked regarding their own country by those not from their country. They read the rationales for the selected visual culture representations and commented in response regarding if and how the representation relates to their life. The commentary and selected representations were the source for collaborative artworks. Participants dialogued about the images in relation to their lives, and constructed art that visually conveyed a particularly meaningful exchange in their dialogue about how the image portrays or does not portray their lived experiences. At this collaborative artmaking stage, participants worked together via email to send their individual visual response to the dialogue and to discuss how to collaborate so that the individual artworks inspire a work created by all in the smaller groups of two or three participants from each country. After uploading the finished collaborated artwork into VoiceThread, participants discussed the artworks and recorded their responses to these three questions: How is subjectivity constructed in the image? Whose subjectivity is constructed? What prior knowledge is assumed? The five collaborative artworks generated from the dialogue concerned specific references to familiar activities, daily-life objects and themes, as well as to larger issues such as power differences, absence of taboo topics, and cultural pride (see Figure 1). Figure 1. Five collaborative artworks created by groups comprised of both Ugandan and U.S. participants during the 2010 Transcultural Dialogue project. How will faculty and students in institutions of higher learning initiate and sustain online collaboration under the constraints of cultural and geographical distance? What are cultural differences between the Ugandan and U.S. institutional and personal contexts and how would these potentially affect online collaboration? How will students relate to each other online in terms of their own cultural orientation and what effects would this have on collaborative learning? Which types of social software are familiar to students and how would they enable the creation of communities of learners? Although other studies of transcultural collaborations have diverse goals and backgrounds as well as rules of engagement, almost all show that participants learned to appreciate their cultural differences and others’ perspectives (Ertmer et al. 2011, Camardese and Peled 2014, Leppisaari and Lee 2012, Lindberg and Sahlin 2011) and learned more about their own cultural identity (Leppisaari and Lee 2012, Lindberg and Sahlin 2011). Even though “social matters prove to be the main obstacles for successful virtual collaborative learning” (Tétard, Patokorpi, and Packalén 2009, 5) and language and time zone differences can create difficulties (Camardese and Peled 2014; Sun and Puterbaugh 2013; Higgins, Wolf, and Torres 2013; Leppisaari and Lee 2012; Ertmer et al. 2011), the value of transcultural projects outweighs the challenges in the context of classroom learning for students who do not have many experiences with in-depth dialogue about their cultural beliefs and practices and with creating art with people from other cultures. Several studies have shown that transcultural collaboration motivates the participants because of the opportunity to collaborate with people with different backgrounds (Camardese and Peled 2014; Sun and Puterbaugh 2013; Higgins, Wolf, and Torres 2013; Leppisaari and Lee 2012; Ertmer et al. 2011; Rautenbach and Black-Hughes 2012; Lindberg and Sahlin 2011). Abramo, D’Angelo, and Solazzi (2011) demonstrated that transcultural collaborations provide diversity that leads to greater learning, understanding, and innovation for researchers. Based on their research into collaboration that utilized social media between two academic libraries, one in the U.S. and the other in China, Sue and Puterbaugh (2013) conclude that “the dissimilarities in language, culture, and general outlook provide a richer work relationship” and more meaningful outcome (64). Higgins, Wolf, and Torres (2013) studied collaboration between comparable undergraduate marketing classes in the U.S. and Ireland, in which both U.S. classes used the social media platform ValuePluse but one class did not have the international component. Their research shows a significant difference in students’ learning from their peers in the international group and indicates that the transcultural component adds engagement and interest for students’ learning. The examples above and the Transcultural Dialogue project’s participants’ reflection below all indicate that transcultural collaboration provides meaningful learning experiences and creates an important space for sharing and exchanging perspectives through written text, spoken audio recordings, and images. Moreover, participants, as conveyed in Kabiito’s reflections below, were able to learn how others from a different country view their country. The Transcultural Dialogue project presented here stems from learners’ participation in culturally relevant pedagogy where one’s cultural orientation comes into play (Lu 2008). The Transcultural Dialogue project is designed as a culturally relevant pedagogy with a community of learners. This practice is aligned with what these studies have identified as the significance of transcultural collaboration. Social media can further communities of practice with constructivist learning principles. Constructivist learning begins with learners collaborating with others from their own interests and concerns (Tétard, Patokorpi, and Packalén 2009). Transcultural dialogue makes visible social relations, behavior, beliefs, preferences, and orientation toward others. Ligorio and Van Veen (2006) note: “The community of learners approach focuses on the social dimension of learning and considers collaboration to be the engine of learning” (105). To create a community of learning requires three component parts: cognitive presence, teaching presence, and social presence (Anderson 2008). Cognitive presence refers to learners’ reflective and sustained dialogue to challenge their assumptions and construct new understandings, a transformative learning. Students perceive teaching presence when facilitators are engaged in making and sustaining the dialogic space of learning. With social presence in particular, students establish supportive environments in which they “feel the necessary degree of comfort and safety to express their ideas in a collaborative context, and to present themselves as real and functional human beings” (Anderson 2008, 344). Presence in contexts with the potential for dialectic and dialogic learning can be democratic spaces “whose relationships mediate learning as much as the processes and tools that are in play” (Ravenscroft et al. 2008, 6). In dialogic educational spaces, new forms of intersubjective orientations are created in which transformative learning can happen. It is from these premises of democratic spaces for culturally relevant practice with a community of learners that the Transcultural Dialogue project was launched in spring 2010. In the Transcultural Dialogue model, the intersection between visual culture, stereotyping, and transcultural communication may present problematic issues. For example, transcultural communication has the potential to unveil participants’ hurtful false beliefs and stereotyping of others that stem from mass media consumption. Unfortunately, mass media provides a limited portrayal of others’ reality, and it has the power to (mis)inform and mold our beliefs and opinion of others based on narrow perspectives. If this is the case, a participant’s comments may offend other participants. Also, there is the possibility for misrepresentation, miscommunication, and misinterpretation to occur when participants from different cultures interact with one another using the Transcultural Dialogue model. However, in our experience some participants expressed fear that they might unwittingly offend and none mentioned they were offended, only misinterpreted. Differences in interpretation were discussed in the exchanges. Long waits for responses was the main frustration expressed by U.S. students. Similar to other studies on transcultural collaboration, challenges of scheduling and technology were part of our Transcultural Dialogue project experience. Language was not as great an issue in the 2010 Transcultural Dialogue as it was found to be in other studies involving collaboration between different language speakers (Sun and Puterbaugh 2013; Higgins, Wolf, and Torres 2013; Leppisaari and Lee 2012; Ertmer et al. 2011). Scheduling with time zone differences is a challenge (Camardese and Peled 2014, Sun and Puterbaugh 2013, Leppisaari and Lee 2012). The U.S. students in the Transcultural Dialogue project had regular class meetings twice a week. They often had to wait for the Ugandan participants to respond to their posts because of the different scheduling. This sometimes created disappointment if U.S. participants did not receive responses within their time expectations. Ugandan students participated outside of a structured course, and while this choice to participate motivated involvement, obstacles such as frequent electrical outages and slow bandwidth kept them from responding as frequently as the U.S. students expected. Ugandan participants seemed to be patient with electricity and technology. Some Ugandan participants found particular times of the day provided faster Internet connectivity. Several commented that the Internet is faster when the United States sleeps. Similarly, the concept of time as a constraint or being integral in the constitution of culture may not be understood in the same way. In Uganda, time may appear as a given, whereas in the United States, time is often interpreted as a constraint. For most Ugandan participants, time as a given meant there is a schedule but adherence depends on other life circumstances and situations. For most U.S. participants, they expected to work within the time constraints allotted for the project in a course that had a specific ending date. In addition, technical difficulty was a huge challenge. Munguatosha, Muyinda, and Lubega (2011) state that for developing countries to adopt learning with social media, it requires “self efficacy, reliable technical and administrative support, infrastructure, system interactivity, adequate budgeting and accountability, and a flexible organisational culture” (307). This highlights the challenges in many transcultural collaborations with social media. Sue and Puterbaugh’s (2013) study of collaboration with China and Rautenback and Black-Hughes’ study of collaboration between U.K., U.S., and South Africa also found that technology difference is an obstacle. For our Transcultural Dialogue project, the bandwidth problem altered the original plan of using certain technology, such as Dabbleboard. The art-making collaboration therefore moved to e-mail communication, which is more difficult to track. Difference in time and timing in several other ways is one of the greatest challenges to both online and face-to-face (F2F) collaboration. F2F brings everyone into the same time space and promotes richer learning experiences than online if the time immersed in another culture can be for ten weeks or more. Short visits are mired with problems of tourist views. Ten or more weeks can still be within a semester, making a F2F visit possible for a group of university students. However, ten weeks in an online collaboration may be too short if the time during the ten weeks is divided among many other responsibilities, including work, study, and family. From our experiences, projects spanning less than ten weeks do not work well because shorter durations fail to allow for flexibility with holidays, electrical outages, and other unforeseen events like university faculty strikes or other environmental, cultural, or political crises. Ten weeks is the minimum we have found and fifteen weeks might be the optimal length of time for an online Transcultural Dialogue project so that the focus on creating collaborative art is not lost. Culture is commonly understood as attitudes, beliefs, and daily practices that distinguish one group of people from another. Cultural practices are both sustained and changed through language, material objects including art, and educational, social, religious, and political institutions. However, one’s own culture is often invisible when there is not dialogue about attitudes, beliefs, practices, and material objects with cultural groups different from one’s own culture. Through dialogue and art-making with those from cultures different from one’s own, misunderstandings surface, making visible the nuances and complexity of cultural comparison across space and time. The Transcultural Dialogue project examines issues of cultural difference within and between groups, as well as cultural differences understood through the lens of place and identity—that are socially, historically, politically, and psychologically constructed and practiced. The 2010 online Transcultural Dialogue project revealed cultural differences in conceptualization, dialogue, and application of knowledge and resources available to the collaborating students from both regions. Students in Uganda viewed culture as something that had already been constructed. For the U.S. students, culture existed in the present and was therefore always in a state of becoming; for the Ugandan students, on the other hand, Ugandan culture is perceived in the distant past, prior to colonial legacies that control the present. This represents a contrast in the understanding of culture between the two groups of students. U.S. participants learned about themselves through others’ misconceptions. Knowing how others understand their culture gave them a chance to reflect on the influence of media and visual culture. However, Ugandan participants did not seem to benefit from this because U.S. participants generally lack knowledge about Uganda’s culture. The following are reflections from participants on the process of the 2010 Transcultural Dialogue from a cultural-difference lens. Admittedly, I was unsure of what to expect when beginning my participation in the project. However, I was excited about the opportunity to utilize Web 2.0 to converse and collaboratively create with others whom I likely would not meet otherwise. When thinking about my exposure to the contemporary visual culture of Uganda, I recalled a colorful yet simplistic batik that my cousin purchased in Uganda and now decorates her home. I envisioned the contemporary visual culture of Uganda as handmade artifacts. When asked to bookmark digital visual culture that conveyed how I perceived Uganda and to comment on the websites I selected, I bookmarked Uganda Travel Guide, a site for tourists, which includes information about the traditional crafts of Uganda including pottery, basketry, and wood-carving. I also bookmarked Ugandart, a Uganda Online Art Consortium that includes a video of a 2009 sponsored workshop that facilitated children’s exploration of art in Namungona. The children partook in drawing and jewelry-making, as well as collaboratively created a large oil on canvas mural by contributing painted symbols of familiar objects and living beings including houses, vehicles, and wildlife. This video, while only a glimpse of Uganda, influenced my understanding of the culture represented. Uganda Wildlife Education Centre (UWEC) is another website that I bookmarked. It exists as a conservation education model to educate the public, including youth, on preservation of wildlife. All animals at UWEC have been rescued from poachers, illegal traders, or accidents (Uganda Wildlife Education Centre 2010). My bookmarked websites represented my perceptions of Uganda, as well as my personal interests. Figure 2. Artwork created by participant Christine Liao. Unlike in the transcultural dialogues research previously conducted (e.g., Tupuola 2006, Gilberti 2006), this study takes a new twist. In the studies cited above, the interlocutors are mainly fact-to-face with the members of the dialogue team. In some instances, we have virtual environments in play, but such environments are not the focus of the study. In Tupuola’s transcultural study, for example, she creates an engagement process that in a sense was imaginary, whereby dialogue between youth from different geographical locations was mediated by a transnational researcher who relayed the words of one group to another across borders. This is a far different model from the one adopted in this study where dialogue is in real time, only mediated by technological interfaces. This provides a more inclusive basis for participation in the dialogue. The participants’ location introduces a new dimension to the dialogue where educational technologies are used as a set of tools to facilitate the dialogue. There is an intrinsic connectivity between the platforms under use to facilitate dialogue and the nature of the dialogue itself. The concept upon which the dialogue is built comes with demands of democratic spaces for interaction between dialoguing members. This demand is facilitated by the free access of social media such as Diigo, a tool used in this particular study. Within this space, members are able to exchange views, ideas, and even engage in art-making, even though many of them have never been in real-time encounters outside the virtual environment. The transactional borders are immediately erased to allow real-time dialogue within a common space accessible to everyone regardless of location. In this way, since members in the dialogue are free to enter, exit, and re-enter the space, more democratic means of dialogue are established and the result is a rich collection of trans-cultural texts—texts not bound by borders, ethnicity, age, or gender insofar as the dialogue is shaped into a whole, meaningful text. At the end, all these texts are built into a tangible outcome that constitutes a common structure of texts that bring together new ideas, understandings, and knowledge within a diverse group of people. This is a unique aspect not part of the design of other transcultural dialogue projects. The following is a reflection from one participant in the 2010 Transcultural Dialogue project regarding use of social media with those who are geographically distant and how social media interaction between two groups of people reveals the impact of visual culture. The greatest benefit of using social media in this project is that it provides images and texts of visual culture that are easily accessible on the Internet and going online is most people’s daily experience, at least among the U.S. participants. My first thought about the project came from my own transcultural experience—from Taiwan to the United States. I thought it would be like learning cultural traditions from friends who were born in and grew up within the United States when I first came to the U.S. I knew little about Uganda before participating in the project. I had not even heard much about Uganda from news and other media. The images and stereotypes I had about Uganda were generically similar to my stereotypical understanding about African countries—poor, underdeveloped, and war-torn. I thought it would be a good chance to hear from Ugandans about their own country and culture. However, it was not until starting the project that I realized that Transcultural Dialogue is much more than learning traditions of a different culture from friends of a different country. Through social media, we can see how visual culture and images are prevalent on the Internet and how easily we can obtain mis/conceptions through these visual culture presentations of a country. Knowing how Ugandans learned about the U.S. from these presentations was like putting a mirror in front of the U.S. participants and provided them a different angle to see the impact of visual culture. It is a way to create reflexivity for one’s belief and understanding of culture. Reflexive means turning things back toward itself. Through hearing others’ (people from another country) mis/conceptions of what one (the person from the country that is discussed) believes to know better, the exchange shapes one’s knowledge and critical thinking about truth and myth (C. Liao, personal communication, November 26, 2011). We present reflections on our experiences forming and participating in the 2010 Transcultural Dialogue project using a dialogic first-person writing form to weave a narrative of distinct experiences and positionalities of the four authors of this article. The potential of transcultural dialogue emerges from our collective reflections. Richard: In 2006, while pursuing my doctoral studies at the University of Art and Design Helsinki–TaiK (now Aalto University), I became interested in joining a class titled “Virtual Learning Communities in Art Education: Current Issues and Practices,” taught by Dr. Keifer-Boyd, a Fulbright professor. One of the things I had promised myself before I left Uganda was to create as many linkages and initiate as many collaboration opportunities with foreign universities as possible in order to introduce indigenous Ugandan arts and culture to the world. I presented my ideas for collaboration between Makerere University and Penn State to Dr. Keifer-Boyd. The Margaret Trowell School of Art and Design (MTSIFA) at Makerere University was in the process of transforming its programs to integrate local indigenous cultures into its arts curricula. The Transcultural Dialogue project could support our efforts in revisioning the MTSIFA programs with a focus on Ugandan culture, rather than the current MTSIFA art curriculum based on a modernist European art education curriculum established by the British founder of the school, Margaret Trowell. In March 2009, I visited Penn State, attended some of the classes, and made presentations about Ugandan culture in general. The visit was not only an academic presentation, but also an initial exchange between faculty—those from the U.S. and Uganda. This visit included meetings with university administrators to propose a student/teacher exchange between both institutions. Several students were curious to know about Uganda and how people there lived. A student in one of the classes asked whether they could freely walk into an Internet café and surf the net. I replied that Uganda has Internet cafés. It was an eye-opening experience indeed. While visiting the U.S. at Penn State, it became apparent that we were already moving forward with one of the ways of continuing our collaboration—an online and onsite exhibition of work by MTSIFA and Penn State students. Since we did not have a source of funding that would allow students and teachers to travel abroad, social media would be an inexpensive yet effective option for collaboration. Moreover, our online collaboration would build support networks for teachers and students to travel and study in both university visual arts programs in Uganda and the United States. To begin an exchange, I requested that Dr. Keifer-Boyd visit Uganda. During her trip, she would visit our physical facilities, learn about our infrastructure, study our curriculum, attend some of our classes, and generally make recommendations to collaborating partners on how to proceed with an exchange. She would also facilitate a Transcultural Dialogue project as one of the ways of crossing cultures and transcending the barriers that have, over time, created misconceptions about our own cultures and others. Karen: In preparing a grant proposal, I asked Dr. Venny Nakazibwe and Dr. Richard Kabiito, professors at Makerere University who had visited Penn State in 2007 and 2009 respectively, for feedback on the proposal and a letter of support to include with the funding application. Nakazibwe, the Deputy Dean of the Margaret Trowell School of Industrial and Fine Arts, wrote a letter of support that emphasized the development of “mutual understanding, cultural, and academic exchange.” After introducing the Transcultural Dialogue project to students at Penn State, I traveled to Kampala, Uganda, to introduce the project there with these goals. Christine: I first learned about Transcultural Dialogue from Dr. Keifer-Boyd. In preparing for her visit to Uganda, Dr. Keifer-Boyd asked if I would be willing to participate and lead students at Penn State in the “Visual Culture and Educational Technologies” course during the semester she visited Uganda. Karen: I planned for Ugandan and United States participants to get involved in different stages in the Transcultural Dialogue project in spring 2010. I met with the students at Penn State who would be participating as part of their course taught by Christine in order to explain the project and to inspire their involvement. I also drafted a plan and discussed it with Venny and Richard via e-mail and Skype so that we could launch the Transcultural Dialogue project during my five-week visit to Makerere University. In the first week of my visit to Uganda in March 2010, I met with MTSIFA faculty and studied through observation, artifact exploration, interviews, and reflective journal writing about MTSIFA’s curricula, types of pedagogy, and student and faculty teaching and learning culture. During the second week, through critical reflection from week one at MTSIFA and from my presentation to faculty members about possibilities with Web 2.0 free applications—such as VoiceThread, Diigo, Second Life, Google Docs, and wikis—we developed a plan of action for transcultural critical dialogue with art students and art teachers in Uganda and the United States. In the third and fourth weeks, I participated with faculty and students at MTSIFA and Penn State in the Transcultural Dialogue project. Also, I visited high schools in Kampala to meet art teachers, see their art teaching facilities, and ask if they were interested in a future Transcultural Dialogue project with a high school class in the U.S. The English language is used in the Ugandan schools and there was interest. Almost all students had e-mail addresses. Some of the high school students used e-mail regularly, often after school at Internet cafés. Jennifer: My interest in Web 2.0 technologies’ potential for collaborative, generative, and transformative learning and knowledge stems from my enrollment in New Media Pedagogy, a graduate course taught by Dr. Keifer-Boyd, in spring 2009. During this course, I facilitated Challenging Gender Stereotypes, a week-long online learning activity in which I asked art education graduate students to use Diigo to post critical comments that unveiled their assumptions about the identities of creators of postcards displayed on PostSecret (http://www.postsecret.com) based on the revealed secrets, imagery, color palette, handwriting, and other potential visible indicators of gender stereotypes. This online learning activity led to my further exploration of the potentials for meaningful informal art education via Web 2.0. In spring 2010, I accepted Dr. Keifer-Boyd’s invitation to participate in the Transcultural Dialogue project, as I found it to be an excellent opportunity for powerful transcultural collaborative art-making and exploration using Web 2.0 tools. My cousin Natalie Sara Weaver’s stories about her recent trips to Kampala, Gulu, and Pader in Uganda also inspired my participation in this collaborative project. My cousin’s goal was to teach songwriting as a tool for empowerment by enabling youth to tell their stories of oppression, resilience, and hope in creative and transformative ways, which resulted in repeated trips to Uganda. Natalie piloted a songwriting program for young women living in Uganda who were previously enslaved as child wives, child soldiers, and/or who had been orphaned by HIV/AIDS, poverty, and war (The SONG Project Live 2011). What little knowledge I had of Uganda, prior to participating in Transcultural Dialogue, derives from stories of my cousin’s experiences working with youth and music in Uganda and my own exposure to minimal Ugandan media coverage. Gilberti (2006) cautions against reducing reality to a limited space in dialogue, suggesting instead that we should work toward entering a third space “where differences are understood to be complementary to each other” (33). In this space (also referred to as “relational space”), there is commitment to learning and understanding each other. This outlines the future of transcultural dialogue. Transcultural dialogue emphasizes relations with others, which effectively changes people’s approach to others, in real situations (Mangano 2009). Transcultural dialogue is crucial, as an approach, in eroding assumptions and misconceptions about different cultures and transcending the borders of a single culture to develop a transcultural model of analysis and debate (Dagnino 2012). In an increasingly interconnected world, “cultures are increasingly intertwined and people often constitute their cultural identities by drawing on more than one culture” (Dagnino 2012, 6). Indeed, in addition to creating an open atmosphere where we become more tolerant and get to know new friends, it also creates a space for fundamental explorations of ideas from different perspectives. Although there are still many challenges as outlined in the earlier section, the potentials of transcultural dialogue exceed these challenges. The greatest potential is that it opens up new spaces for collaborations and understandings. This is supported by the belief that new understandings within new cultural contexts open up new ways of interacting, building networks, and creating platforms upon which future interactions are built. Lindberg and Sahlin’s (2011) study on transcultural collaboration found authenticity in students’ learning about a different culture because they were in conversation with those they were studying. Our Transcultural Dialogue project also provided an authentic experience of conversation between the U.S. and Ugandan students. Such an experience motivated some students to want to collaborate further and to travel. Similarly, Ertmer et al. (2011), who used Web 2.0 technologies to facilitate pre-service teacher’s global perspectives, found that because of the transcultural collaboration experience, the pre-service teachers were more likely to incorporate similar activities into their future teaching. Most of the U.S. participants of the Transcultural Dialogue project were pre-service teachers planning to teach art in k-12. Transcultural dialogue in pre-service curriculum could motivate students to include transcultural collaboration in their teaching and participate in cross-cultural activities (Ertmer et al. 2011). Indeed, one of the 2010 U.S. participants, inspired by the 2010 Transcultural Dialogue project, expressed interest in creating a transcultural collaboration with people in Belize, where she has connections. The online collaboration between two groups of people at different locations creates a mashup space where online virtual spaces host real learning experiences. The selected websites, discussion texts, artworks, and voice reflections are the elements that constituted our transcultural mashup experiences. With changing technologies, we expect that ways of communicating between distances will improve. We envision that some of the misunderstandings between cultures will change, but also caution that new misconceptions may arise. Transcultural Dialogue is a space where students from different cultures can develop new knowledge about each other, and visual culture, texts, images, and voices can be mashed up to create new meanings. The Transcultural Dialogue project utilized Web 2.0 technologies to create a mixed reality experience in which participants brought their physical lived experiences into virtual space and created unique insight and knowledge that was not easy to obtain through classroom lectures alone. Accessible Web 2.0 technologies afforded participants the opportunity to deconstruct, construct, and reconstruct cultural narratives through the sharing of the personal in a global public space via transcultural, collaboratively generated user-content that disrupted stereotypes and preconceived notions. This approach can be developed further in the future when technology and energy infrastructure improve worldwide. Translation, transfer, critique, and questioning of relevance to the context were important to setting up the online architecture and facilitating the dialogue in this project. The Transcultural Dialogue strategies are intended to further understanding and to celebrate and sustain difference. In our work to pedagogically enact this goal, we have identified challenges, tried solutions, and continue to develop an arts-based research and teaching methodology. Camardese, Amy, and Yehuda Peled. 2014. “Using Technology to Bridge Cultural Differences.” Delta Kappa Gamma Bulletin 80 (2): 21–34. Gay, Geneva. 2000. “Culturally Responsive Teaching: Theory, Research, and Practice.” New York: Teachers College Press. OCLC 45729009. Human Rights First. 2012. “Rebecca Chiao: Shaming Street Harassers with Social Media and Community Outreach.” http://www.humanrightsfirst.org/2012/11/09/harassmap-founder-makes-wave-against-sexual-violence-in-egypt. Lu, Pei Chi. 2008. “Web2.0 and the Application of Art Education”. Taipei, Taiwan: National Taiwan Normal University. http://www.ntnu.edu.tw/acad/rep/r97/a3/a302-1.pdf. Mangano, Maria Flora. 2009. “An Experiment of Transcultural Dialogue Course in an Italian Theological Faculty.” In Conference on Intercultural Dialogue. Istanbul, Turkey. http://citation.allacademic.com/meta/p_mla_apa_research_citation/3/0/5/1/5/pages305153/p305153-1.php. Mason, Rachel, Liam Gearon, and Yordanka Valkanova. 2006. “Art and Design: A Systematic Review of the Contribution of Art Education to Cultural Learning in Learners Aged 5–16”. University of London. http://eppi.ioe.ac.uk/EPPIWebContent/reel/review_groups/art/review_two/art_rv2.pdf. Tétard, Franck, Erkki Patokorpi, and Kristian Packalén. 2009. “Using Wikis to Support Constructivist Learning: A Case Study in University Education Settings.” In Proceedings of the 42nd Hawaii International Conference on System Sciences, 1–10. http://dx.doi.org/10.1109/HICSS.2009.499. The SONG Project Live. 2011. “The SONG Project.” https://www.youtube.com/user/TheSONGProjectLive?mid=5411. Ugandart. 2008. 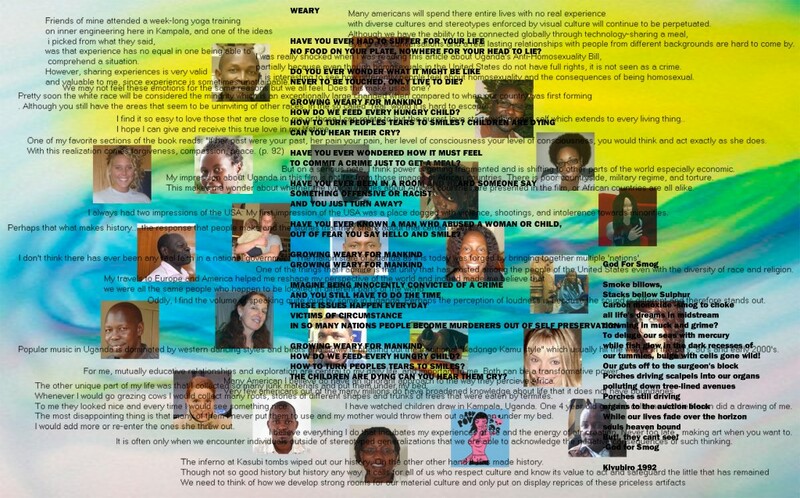 “Uganda Online Art Consortium: A Project of KISA Foundation USA.” http://ugandart.com. Uganda Wildlife Education Centre. 2010. “About UWEC.” http://www.uweczoo.org. Martina Paatela-Nieminen, Richard Kabiito, and Karen Keifer-Boyd developed the first iteration of the Transcultural Dialogue project in 2007 titled Intertextual House. The goal was to foster an intertextual approach to inquiry and engagement with others concerning the subjective process of producing meaning from relationships between images, discourses, and cultures of house as experience, symbolism, and metaphor (e.g., governing houses as in House of Parliament, body as house as in Louise Bourgeois’s art (1947-1993, see http://maddicara.com/2013/12/10/documents-of-memory-the-house-and-the-body-in-the-work-of-louise-bourgeois/), and house as site of identity and societal expectations as explored in WomanHouse (1970-71) and At Home in Kentucky (2001-2002) art installations. An intertextual interpretation emphasizes social and cultural contexts of images as the necessary framework for understanding meanings and functions of signification systems. Other Transcultural Dialogue iterations included Keifer-Boyd’s courses with Kabiito’s or Paatela-Nieminen’s courses, or both together. Kabiito and Keifer-Boyd continued to incorporate the Transcultural Dialogue project in our courses in fall 2010, 2011, and 2012 semesters (Keifer-Boyd 2012). The fifth iteration is being planned for 2015. Participatory pedagogy refers here to the participation of many people in a dialogue about visual culture in which their dialogue is the artistic medium and material from which collaborative artworks are created. Communities of learners, also referred to as communities of practice, are formed from shared interests in which the community utilizes collective resources of experience, skills, and shared access to materials and facilities (Wenger-Trayner 2006). Dabbleboard was an online whiteboard for collaboration. Users can type, draw, or import images to create a board together. It was shut down in August 2012. VoiceThread enables users to post images, documents, or videos, and others can make comments using voice recording, video recording, or text. ValuePluse (ValuePulse.com) is a social media platform that allows users to download and share news with others via RSS news feed. It enables real time discussion on news. Uganda Travel Guide. 2010. “Welcome to Uganda Travel Guide.” http://www.ugandatravelguide.com/. Uganda Wildlife Education Centre. 2010. http://www.uweczoo.org. Sarah Palin was the governor of Alaska from 2006 to 2009 and the Republican candidate for vice president of the U.S. in 2008. For further information about the Challenging Gender Stereotypes activity, see “PostSecret: Disrupting Gender Stereotypes” (Motter 2010). Karen Keifer-Boyd, Ph.D., is professor of art education and women’s studies at the Pennsylvania State University. She is past president of the National Art Education Association (NAEA) Women’s Caucus (2012-2014), NAEA Distinguished Fellow Class of 2013, and 2012 Fulbright Distinguished Chair in Gender Studies at Alpen-Adria-Universität Klagenfurt, Austria. She serves on the NAEA Higher Education Research Steering Committee; on the Council for Policy Studies; and as past coordinator of the Caucus on Social Theory. She is co-founder and co-editor of Visual Culture & Gender, and has served on 15 editorial and review boards. She has been honored with leadership and teaching awards, including two Fulbright Awards (2006 in Finland and 2012 in Austria) and the 2013 Edwin Ziegfeld Award. Her writings on feminist pedagogy, visual culture, inclusion, cyberart activism, transcultural dialogues, action research, social justice arts-based research, and identity are in more than 50 peer-reviewed research publications, and translated into several languages. She co-authored Including Difference: A Communitarian Approach to Art Education in the Least Restrictive Environment (NAEA, 2013); InCITE, InSIGHT, InSITE (NAEA, 2008); Engaging Visual Culture (Davis, 2007); co-edited Real-World Readings in Art Education: Things Your Professors Never Told You (Falmer, 2000); and served as editor of the Journal of Social Theory in Art Education and guest editor for Visual Arts Research. She is coordinator of the Judy Chicago Art Education Collection. Christine Liao, Ph.D., is an assistant professor in the Watson College of Education at the University of North Carolina Wilmington. She received her Ph.D. in Art Education with a minor in Science, Technology, and Society from The Pennsylvania State University. After receiving her Bachelors and Masters degrees from National Hsinchu University of Education she was an elementary school art teacher in Taiwan, where she originates. She taught Visual Culture and Educational Technologies from 2008-2011 at Penn State. Currently, she is teaching arts integration to elementary undergraduates and graduates at UNCW. Her research interest focuses on avatar creation, embodiment, identity, and new media in art education. She has published in journals and book anthologies including Journal of Art Education, Visual Culture and Gender, Journal of Virtual Worlds Research, and Visual Arts Research. She is also the Chair of Art Education Technology Issues Group (2014-2016) in the National Art Education Association. Jennifer Motter, Ph.D. graduated from The Pennsylvania State University in May 2012. Her doctoral research “Feminist Art Curriculum: Politicizing the Personal via Cyberpost Activism” involves socially-responsible and culturally-responsive art education. Through Motter’s research and praxis, she aims to encourage meaningful experience-based artmaking and strategic social media interventions in order to promote and facilitate social justice. Motter is particularly interested in the empowerment potentials of new media for marginalized groups, such as girls and women. She is co-president of the National Art Education Association Women’s Caucus. Motter is a new media art program developer and teacher at a middle school in Western Pennsylvania.